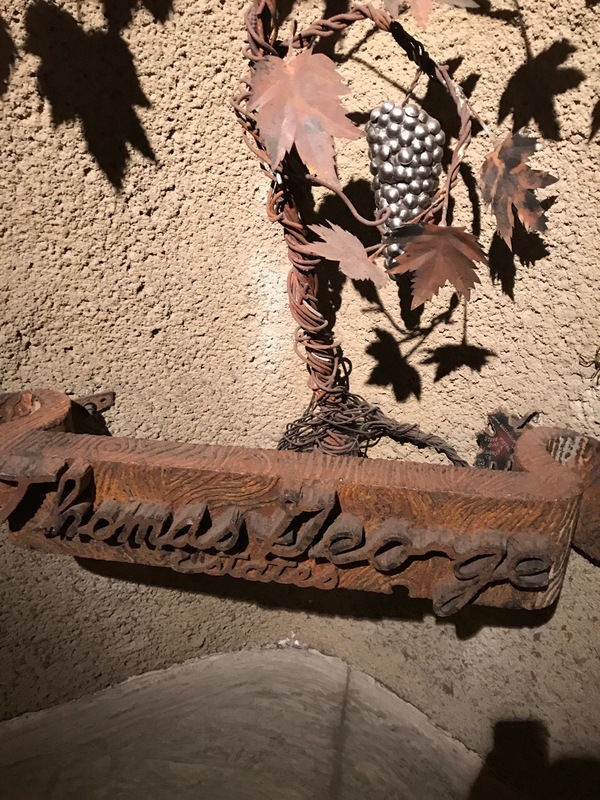 On Friday night of the 2017 Wine Bloggers Conference, we decided to take part in a wine dinner excursion at Thomas George Estates in Healdsburg. Thomas George is located in the Russian River Valley AVA of Sonoma County. They were founded in 2008 and focus on small production vineyard designated Chardonnay and Pinot Noir. We loaded on our bus and headed out. After a twenty plus minute drive in the darkness which included a wrong turn by the driver and a trip across a one lane bridge over the Russian River, we made it up the hill to Thomas George Estates. As we arrive the tasting room was on one side and the wine cave was on the other. Dinner was being served in the wine cave. Immediately upon entering the wine cave, we were greeted with glasses of the 2014 Brut Blanc de Blancs, Starr Ridge Vineyard, Cooper Block. The grapes for this wine were sourced from the Russian River Valley AVA. Starr Ridge Vineyard is located a few miles to the east of the winery. To accompany the sparkling wine, we were served house-made cured meats from the Black Pig Meat Company. The Black Pig is meat company owned by the evening’s chef, Duskie Estes. Duskie is co-owner of Zazu Kitchen + Farm with John Stewart. Duskie has also appeared as a judge on Guy’s Grocery Games on the Food Network. In addition to the meats, there were roasted vegetables, spreads, and crostini. After reception, we took our seats at the long table. The first course was a roasted Brussel sprouts salad. The salad included bacon from the Black Pig, Asian pears, Marcona Almonds, aged sherry vinegar, and Capriago from Bohemian Creamy. The paired wine was the 2015 Chardonnay from Sons & Daughters Vineyard. This vineyard is located at the border of the Russian River Valley and Chalk Hill AVAs. This unoaked wine was aged sur lie with no malolactic fermentation. The featured wine for the entrée course was the 2014 Pinot Noir from Baker Ridge Vineyard. This vineyard is on the winery site. Duck is, of course, a perfect pairing with Pinot Noir. This Star Anise Liberty Duck also included Cracklin’ Pork Belly with black rice, estate grown pomegranate and watercress. This was perfectly paired! We were allowed some time to finish our Pinot Noir after dinner before dessert was presented. Dessert was a Quince and Apple Tartin with Bourbon Gelato. The 2012 Late Harvest Viognier from the Baby Block of Baker Ridge Vineyard was the wine of choice. The grapes for this wine are always hand harvested by the staff at Thomas George estates. This block is closest to the driveway leading to the winery. It was a beautiful wine! Following dinner, Chef Duskie Estes came out to introduce herself and talk about her meal. She’s quite the accomplished chef including appearances on Iron Chef and a 2001 James Beard Award. We made a few purchases and loaded the bus to head back to the hotel. If you’re ever in the Russian River Valley, be sure to go check out the Zazu Kitchen and Thomas George Estates!